A small, ornamental grass native to the wet, rocky cliffs of Japan's Honshu Island, including the area around Mount Hakone, after which the species is named. 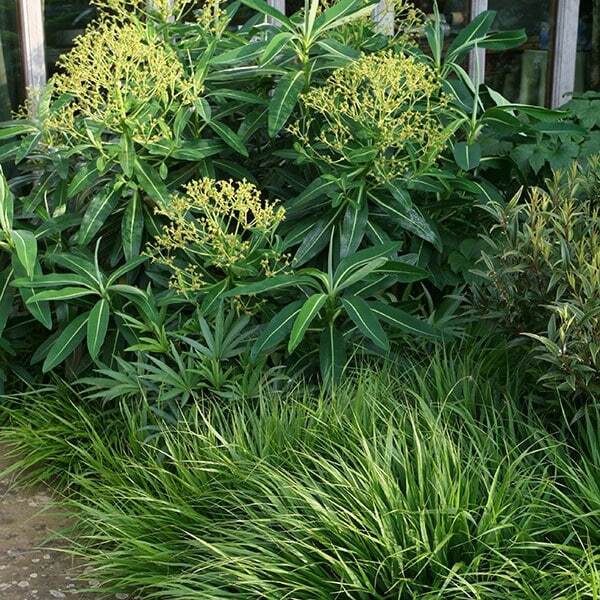 It is a slow spreading, deciduous grass which builds into gently cascading hummocks of bright green that are useful as a simple understorey to light shrubs and as a soft edging to paths or steps. Fine, light sprays of lime green flowers appear during June and July, giving a billowing lightness to planted drifts. The clean, minimalist style of this grass makes it a good choice for formal courtyards or in minimalist urban planters and the fresh green foliage gradually acquires rich russet tones as autumn advances. Planted this grass randomly amongst Rosemary, chives and thyme shrubs and was stunned at how this Very mobile grass enhanced my herbs. It changes to autumnal colours and looks as if it going to flutter Away.